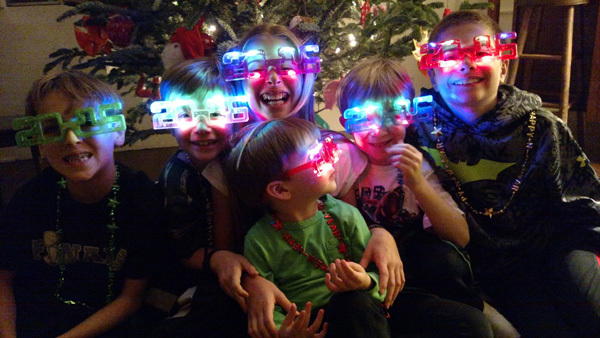 January 4th is the 10th anniversary of my blog and it is always a good time for reflection and planning. 1. Goal: To sketch and paint everyday, and to blog twice each week. These activities give my retirement life some structure and provide enormous inspiration within an artist community. 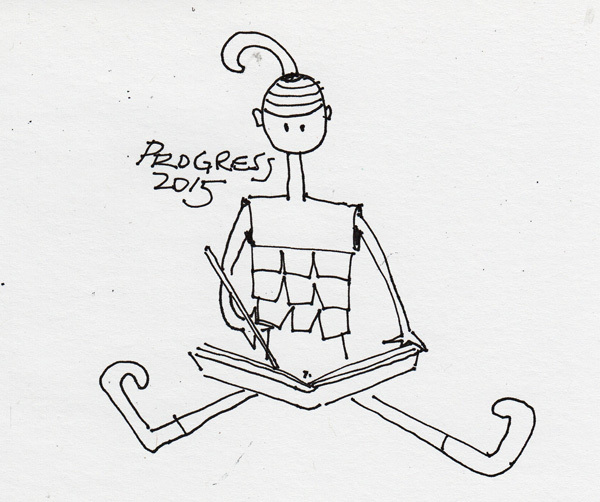 Progress: I no longer do quick sketches every day, but no week passes without me having several good drawing sessions. It was really important to me to sketch daily when I was beginning this journey as I prepared for retirement from medicine, but the habits were formed and now I can rarely pass a few days without some scribbles, if not a full sketchbook drawing/painting. My blog posts are important to me, and continue to give structure and meaning to my art adventure and posting twice each week is a great schedule. Progress: I participated in several online classes this year, just enough to be inspired on an almost weekly basis during some months: Studying Under the Masters 2, Sketchbook Skool Semester 4, and an assortment of Craftsy Classes. These included: Close-up Flowers in Watercolor (Nan Carey), Travel Sketching in Mixed Media and Sketching People in Motion (both Marc Taro Holmes), I also took a surface design class through Craftsy: Fabric Patterning with Wax Resist with Malka Dubrawsky. 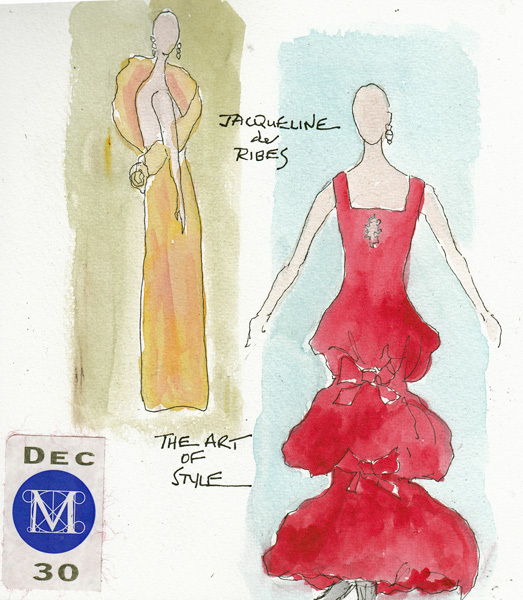 Each semester, for 14 weeks, I took a class at Fashion Institute of Technology (FIT) and was lucky enough to register for Drawing and Watercolor classes in 2015. As with the other classes I've taken there on subjects about which I already have some knowledge and experience, I always learn something new. Our few drawing classes on perspective were excellent and our watercolor classes on different palettes and the use of Chinese White (with watercolor) and Black gesso (with gouache) as grounds were completely new to me. 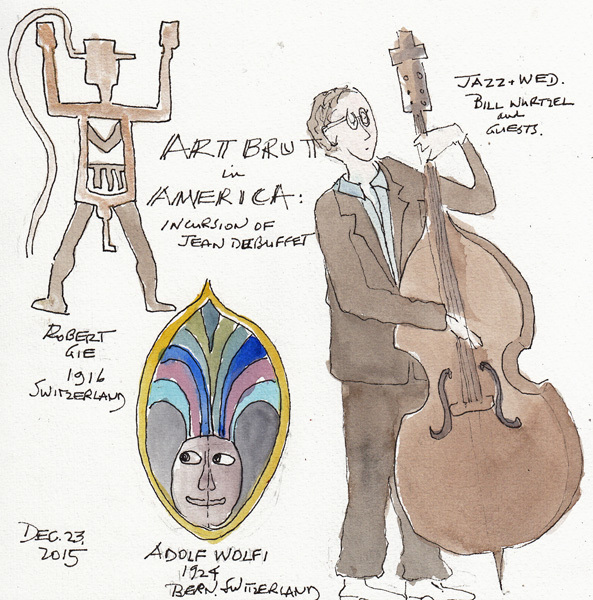 Progress: I belong to two Meetup groups and attend semi-regularly, schedule permitting: "Central Park Drawing and Art" and "Drawing New York." 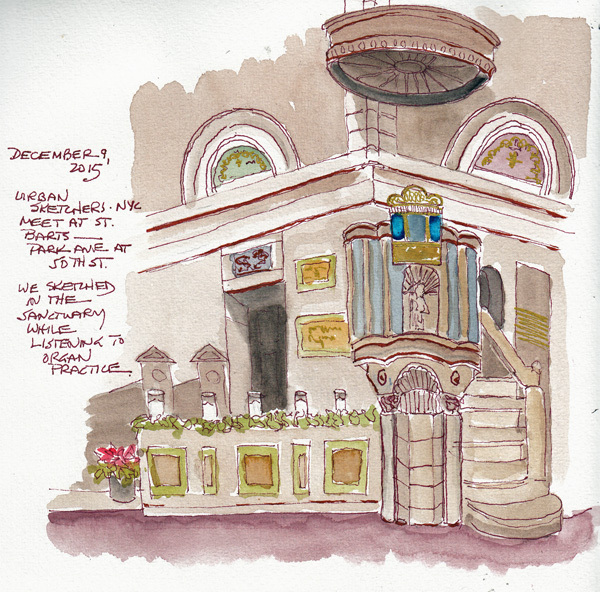 We have an NYC-Urban Sketchers Weekday Group, and that provides other opportunities for group inspiration and contact. Battery Park City Conservancy has weekly Nature Painting and Figure Drawing from May through October and I regularly participate in both the morning and afternoon sessions, weather permitting. This year I attended figure drawing at Society of Illustrators with two visitors, my dear friends Sara from Alabama and Casey from France, and a series of Toulouse-Lautrec Café Society Figure Drawing sessions at MoMA. And last, but not least, my very special days, spent with my artist friends Benedicte, Pat, and sometime Teri, means that we rarely miss the best museum and gallery shows in the City. I would feel very isolated without these special 3 friends and would have many fewer good laughs! One of my favorite projects this year was participation in the 100 Day Challenge by Elle Luna and The Great Discontent. My goal, especially after taking Sketchbook Skool Semester 4, was to draw more from my imagination. I didn't upload my daily drawings to Instagram, or follow along with other people's projects, but once I committed to it, I was faithful to the project for all 100 days, and even created my little imaginary character Axel. Progress: I made cased-in watercolor books for my daily sketchbooks, accordion journals for our outdoor Urban Sketchers sessions, a travel sketchbook for our vacation in Spain from an old book of Spanish Drawings, and a summer travel sketchbook from a recycled book called Colors of the Sea. All of these are discussed and photographed in daily blog posts in my bookbinding category on the blog. July was my big surface design month, during which I spent part of almost every day dying fabric, exploring new techniques, and creating dyed fabric for bookcloth. In the process I also made dye samples and created a unique sewing pattern for a pencil-pen pocket which goes around my sketchbook cover with Velcro. 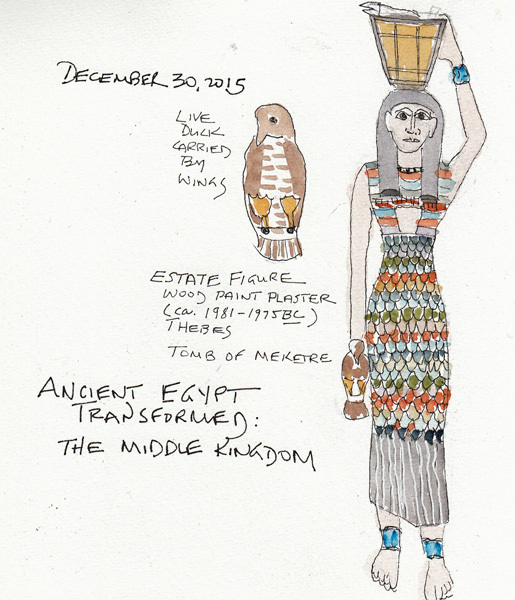 It is a wonderful convenience when I am sketching as I walk around museums and galleries. Even Axel and his friend Alice made an appearance on fabric - using thick dye for the drawing and color. This year I also planned to make another batch of paste paper to use for covering bookboards and/or as endpapers, but I didn't deplete as much of my stash as I thought I might. 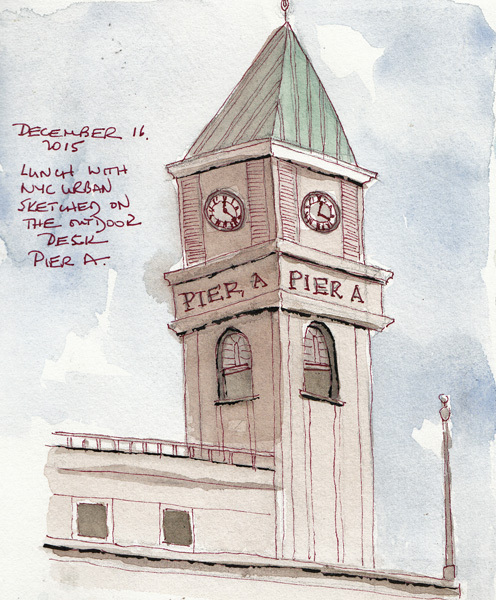 NYC Urban Sketchers meet once on a weekday and once on the weekend, most weeks. 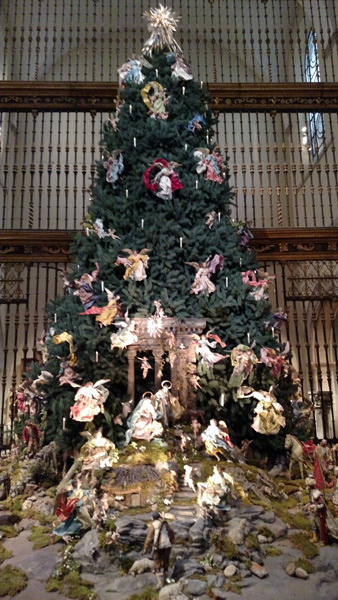 During December the weekday group met in several "houses of worship" in New York City. 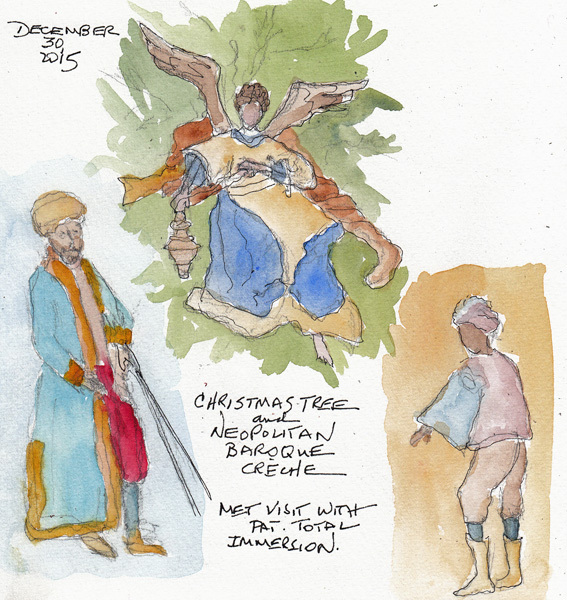 On December 9th I sketched this interior at St. Barts on Park Avenue. Drawing and painting interiors are something I like to do, but rarely manage. In the afternoon Benedicte, Pat, and I went to the Whitney Museum for a Tour of the current Archibald Motley exhibit which was led by a friend of mine. 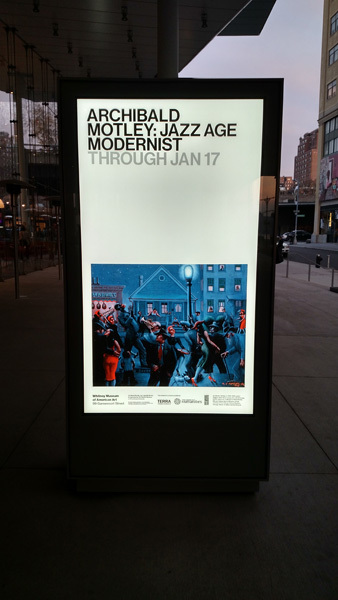 It was wonderful, and since I knew nothing about him and immediately fell in love, I'm going to include information from the exhibit at the end of this blog post. 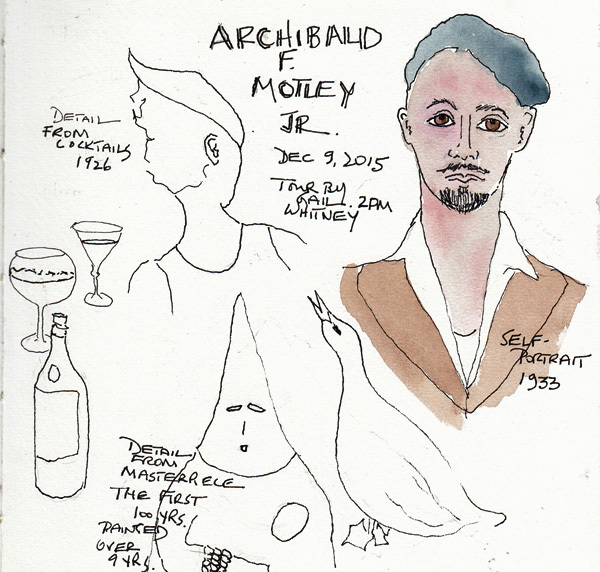 These are quick drawings done while on tour and come from several different paintings, including an early self-portrait of Motley. 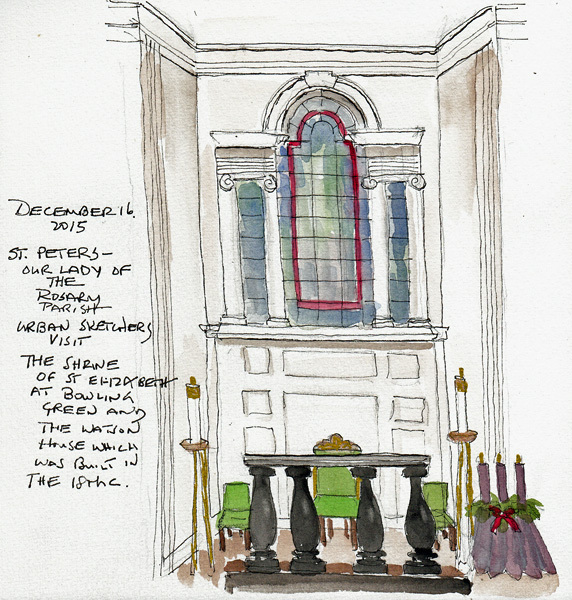 This past Wednesday we met at the very small Shrine of St Elizabeth at Bowling Green and I sketched another interior. We had to leave after an hour and we walked to Pier A in Battery Park and had lunch on the outdoor deck. It was beautiful sitting in the sun at the edge of the water in New York Harbor. 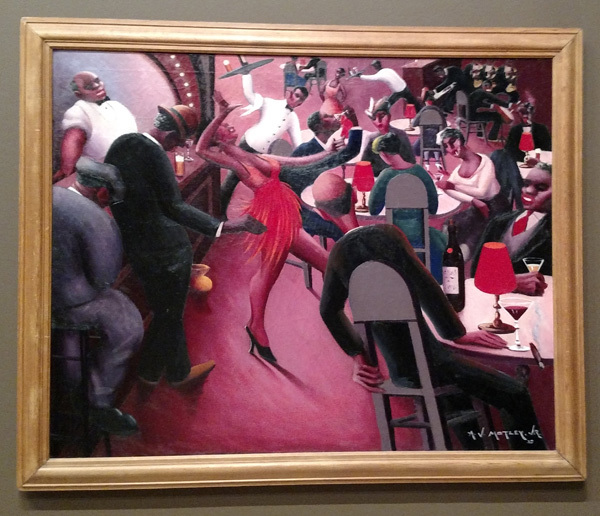 I loved his use of color and spatial relationships - and everything he painted reflecting the Jazz-age in Chicago. 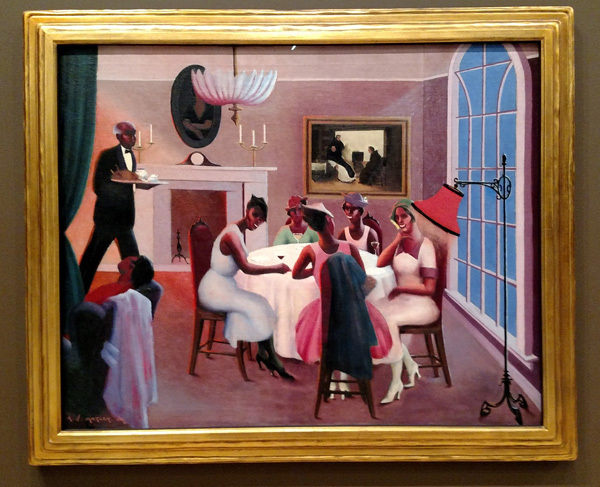 "The artist created a far more daring visual language than many of his contemporaries, fusing vivid narrative with dizzying spatial distortion and jarring hues to produce striking settings for characters of diverse racial backgrounds and social classes. 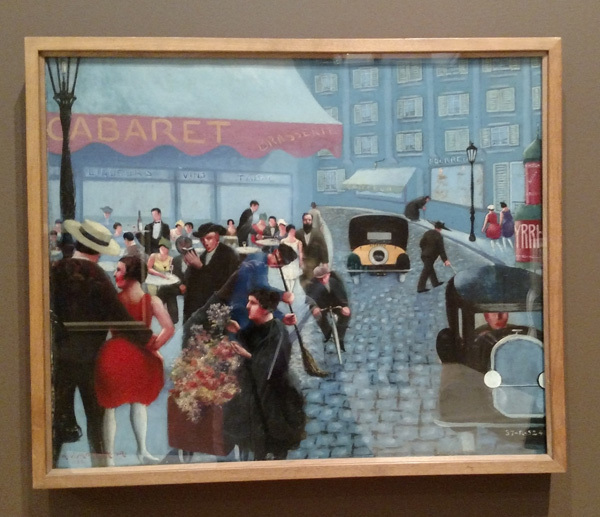 And while his portrayals range from serene and august portraits to abrasive or outrageous caricatures, all were his instruments for addressing the poignancy, folly, and complexity of modern life." The First Hundred Years: Painted over 9 years and never signed. 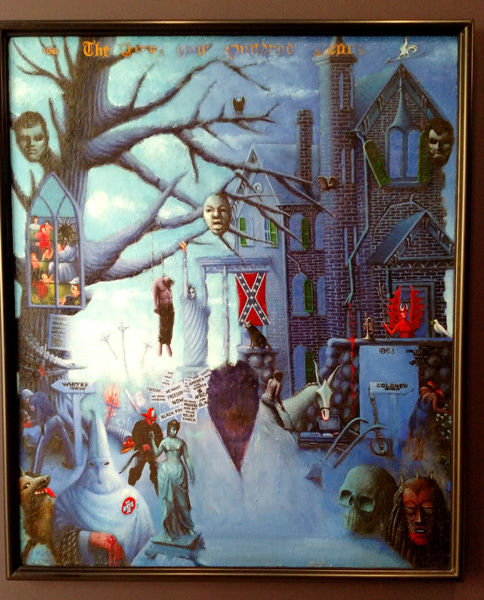 And after this painting, Motley never lifted a brush again during his lifetime. 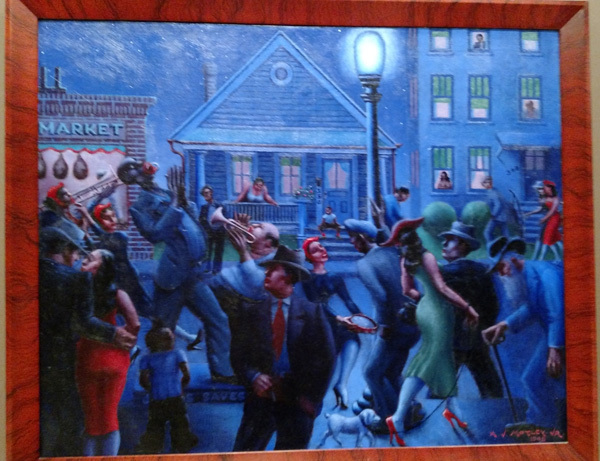 This overt political painting is said to be a modern allegory on the history of race relations in American. 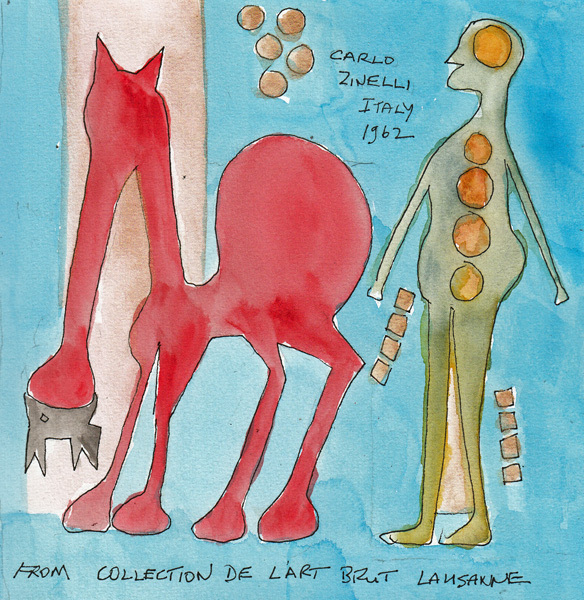 He began the painting in 1963, and finished it in 1972. It includes the heads of John F. Kennedy, Martin Luther King, and Abraham Lincoln - and a confederate flag, a lynching, and a KKK member, among other atrocities. Today is Wednesday, and we are off to the Frick Collection, followed by lunch and the Folk Art Museum. Before going to my last Watercolor class, I spent the afternoon at a Museum of Modern Art class related to the amazing Picasso Sculpture exhibit. We spent an hour in the exhibit with a museum educator discussing individual sculptures and techniques. In the second hour we went to a classroom, did 3 fast preliminary exercises, and then made our own sculpture using paper, cardboard, and tape. Exercise 1 - make a sheet of copy paper into a 3D object. Exercise 2 - Turn 2 pieces of 5X5" cardboard into one 3D object using scissors. Exercise 3 - Attach one 5 X 5" cardboard square, perpendicularly, to another, using tape. I folded each piece in half, like an "L", and then put the upright parts of the "Ls" together, back to back, with tape. This was a very stable structure, with a base and a perpendicular strong upright piece. I extended the idea for my original sculpture. We were given black paper, brown cardboard, black tape, and a piece of white corrugated paper, and were asked to make the materials into a sculpture related to us personally. So I had to include my imaginary friend Axel. The black triangle is the front part of the base like I created in Exercise 3. It was so interesting that the 3 simple preliminary exercises were like short pose warm-up figure drawings, and opened our minds and warmed up our hands!